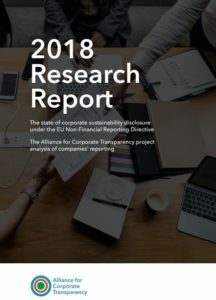 The Alliance for Corporate Transparency project has analysed how European companies disclose information necessary for understanding their impact on society and the environment, as required by the EU Non-financial Reporting Directive. The initial findings of the project point to one overarching conclusion: most companies acknowledge in their reports the importance of environmental and social issues, but more often than not this information is not clear enough in terms of concrete issues, targets and principal risks. This year, the project has assessed over 100 companies from the sectors of Energy & Resource Extraction, Information and Communication Technologies, and Health Care. 90% of companies report on climate change, but merely 47% specify clearly what precisely their policy has been designed to achieve and how. As regards the Energy and Resource Extraction sector, which makes the biggest contribution to climate change and faces the biggest transition risks, it is alarming that only 26% of analysed companies framed their reporting around achieving a transition to a below 2°C scenario and only 21% of companies reported on both short and long time horizons (as recommended by the TCFD. There is a gap between the number of companies providing information on anti-discrimination or equal opportunities policies, which are disclosed by 80% of companies, and the disclosure of the effects of these policies – reported by only 36%. Very few companies include outsourced workers in their perspective: only 25% inform about how many there are in the workforce, but less than 5% include them in their reporting on equal opportunities, collective bargaining or salaries. Similarly, only 10% of companies report on the living wage and very few disclose country-by-country information on region-sensitive issues such equal opportunities (6%) and freedom of association (10%), even though a majority of companies included in the research have operations outside Europe (80%). Over 90% of companies express in their reports a commitment to respect human rights and 70% endeavour to ensure the protection of human rights in their supply chains as well. However, only 36% describe their human rights due diligence system, 26% provide a clear statement of salient issues and 10% describe examples or indicators of effective management of those issues. 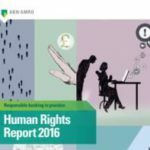 Companies commonly report information about human rights audits (58%), but the disclosure of results of these audits is far less common (25%) as is disclosure of the actions consequently taken (16%). Similarly, only 8% of companies discuss the limitations of the audits, despite the fact that these limitations are universally recognised, as demonstrated by Rana Plaza collapse in 2013 and countless other accidents in audited factories. As shown across the research, there is a considerable focus on the disclosure of commitments and a lack of details on their implementation. While there is a high level of reporting on commitment against bribery (91%), whistleblowing channels (76%), training programmes (75%) and rules on gifts and hospitality (73%), relatively fewer companies actually explain the main elements of their anti-corruption programme (63%). Likewise, the applicability of companies’ rules to third parties is explained by 60% with respect to business partners, and 43% for agents, advisors and intermediaries. Lastly, only 10% of companies disclose their lobby expenditures and the public positions that they lobby for. This is especially worrisome in the context of investor- company relationships and the urgent need for a policy reaction to systemic risks such as climate change. Ensuring high quality disclosure on sustainability has a vital role in efforts to reorient capital flows towards sustainable investments and manage risks stemming from climate change, environmental degradation and social issues. These are the objectives of the EU Action Plan on Sustainable Finance. 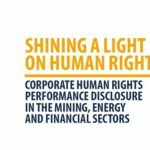 Companies’ disclosure is also a key element in ensuring corporate accountability for identifying and addressing risks of adverse human rights impacts in line with the UN Guiding Principles on Business and Human Rights. In addition, mismanaged human rights and environmental risks may result in significant short-term as well as long-term economic impacts on companies in the form of accidents, litigation, supply chain disruptions, damaged reputations and failed or delayed investments. However, as the research demonstrates, the current status of corporate sustainability reporting does not allow investors and other stakeholders to understand companies’ impacts and risks, and their strategies to address them. The Alliance for Corporate Transparency is a three-year research project bringing together leading civil society organisations and experts with the aim of analysing the corporate disclosure on sustainability issues by the 1000 largest companies operating in the EU. The objective of this initiative is to serve as guidance to companies and regulators, provide data to substantiate the discussion on the standardisation of sustainability disclosure and put forward evidence-based recommendations for legislative changes. *The EU Non-financial Reporting Directive introduced into EU law the requirement for large public companies and financial corporations operating in Europe to disclose information on environmental, social, human rights and anti-corruption matters, necessary for understanding the company’s development, performance, position and impact. Companies were supposed to include this “non-financial” information in their reports for the previous financial year for the first time in 2018. The Directive is a first step in the right direction but failed to specify what concrete information must be disclosed. This severely undermines the legislation’s objective to increase the relevance, consistency and comparability of corporate sustainability data, which is crucial for investors to help inform their decisions as well as for civil society and public authorities to assess and monitor corporate responsibility. To fill this gap, the project draws from EU law, international standards and leading reporting frameworks in order to determine what information is commonly understood to be essential and material for each industrial sector. The research assessed whether a selection of 105 European companies are providing the type of information explicitly required by the NFR Directive; i.e. the description of policies and due diligence processes, outcomes, principal risks (including with respect to business relationships), and KPIs. It also examined if the disclosed information was specific enough to allow an understanding of companies’ impact and strategy. In addition, the research analysed companies’ disclosure on particular important environmental and human rights issues and on their anti-corruption programmes. Members of the Alliance for Corporate Transparency include: Frank Bold, Sustentia, Business & Human Rights Resource Centre, CORE Coalition, Future-Fit Foundation, Transparency International EU, WWF, CDP Europe, Client Earth, Germanwatch, Oxfam, Stockholm Environment Institute, Shift and Themis Research. The project plans to extend the scope of the research in the next two years to cover 1000 companies from all sectors and regions in order to provide a comprehensive analysis and well-substantiated recommendations to companies and policy makers alike.